I want to share these photos of an excellent stoneware pickling weight for one- and two-quart mason jars. 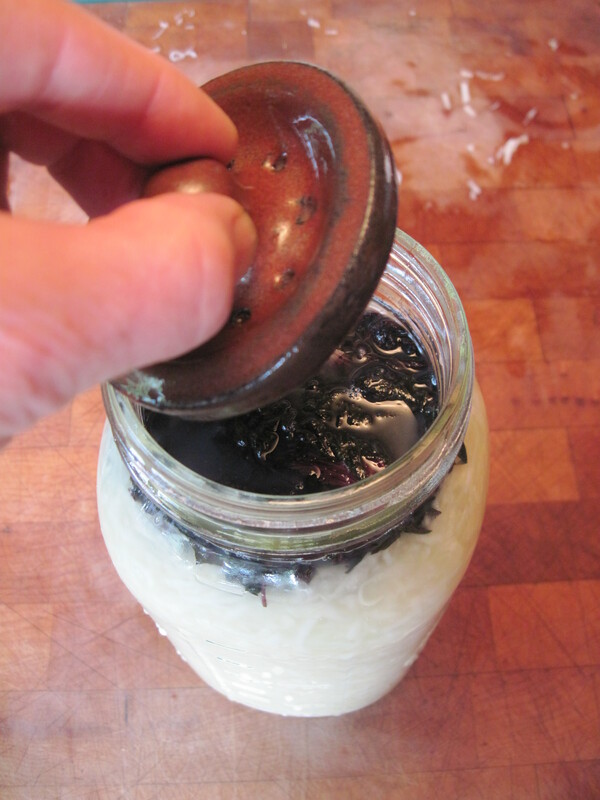 Note the cute little knob handle and the holes to let the brine through. The weight was designed and created by Ken Albala, a prolific author of culinary history books and a professor at the University of the Pacific who somehow finds time to putter in his pottery. Do you suppose we could convince Ken to quit his other gigs and devote himself to supplying the world with pickle weights? The dark stuff on top of the kohlrabi, by the way, is red shiso, wilted with a little salt. I’m hoping that the shiso will prevent any yeast growth while also turning the kohlrabi pink. 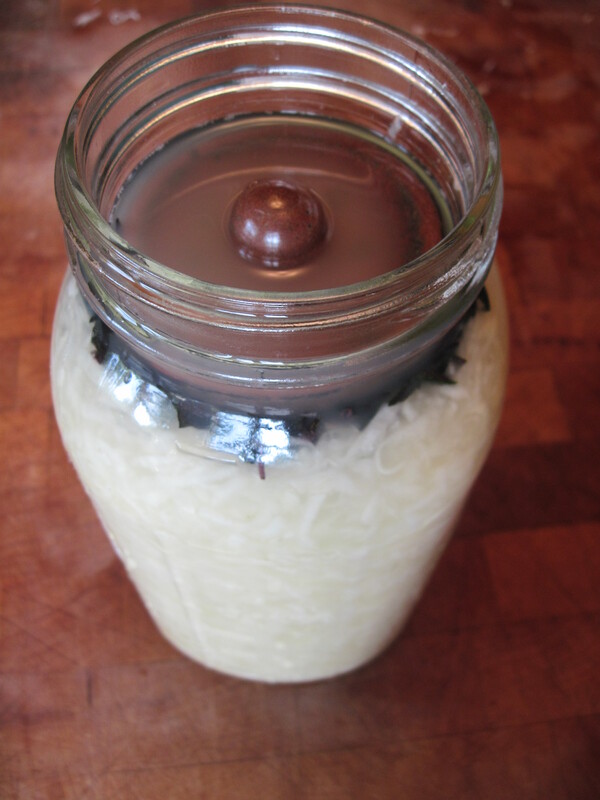 If the kraut turns out well, I’ll post another photo later. When you visit Ken Albala’s blog, be sure to see the post on Funky Dust Pickle Powder. Ken simply shaved some brined cucumbers thin, dried them in a dehydrator, and ground them to a powder to use as a sour and spicy seasoning. I may have to try this myself. Another of my favorite bloggers, Nadia Hassani of Spoonfuls of Germany, is giving away a copy of The Bengali Five Spice Chronicles. 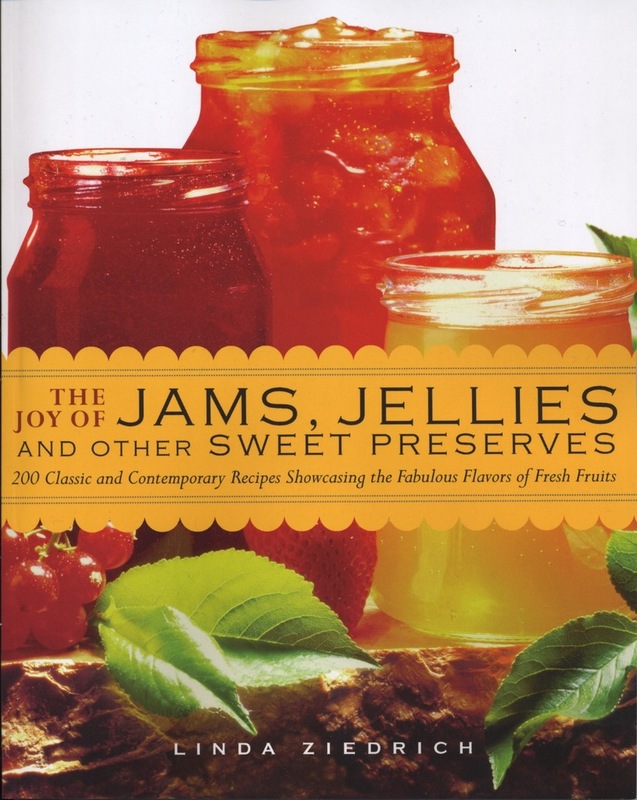 If you’d like a chance to win this cookbook, let her know before Friday, September 27. 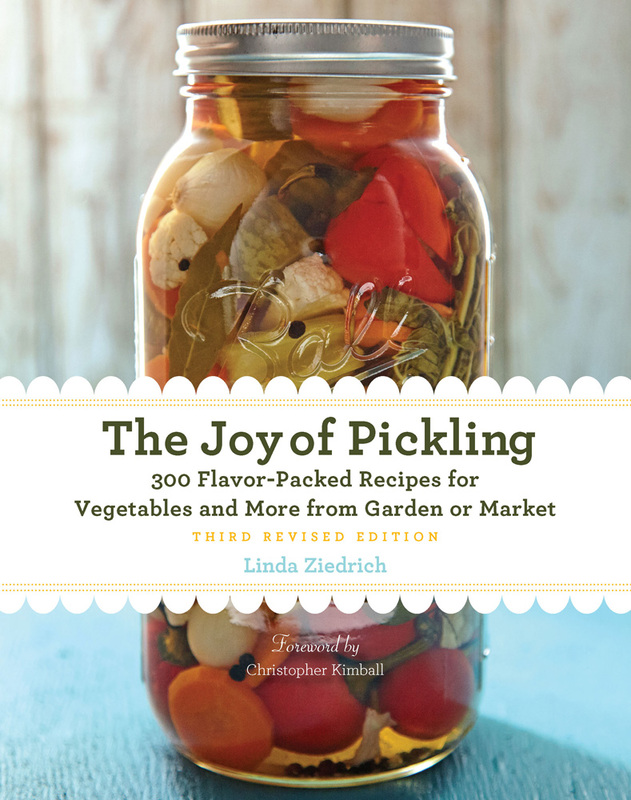 This entry was posted in Books and blogs, Fermented foods, Pickles, Vegetables and tagged cookbook giveaway, fermentation, Ken Albala, kohlrabi, Nadia Hassani, pickle dust, pickling. Bookmark the permalink. I want one of those! What I’d really like to have is a crock like my Oma had…hint hint Ken 😀 thank for sharing this Linda.